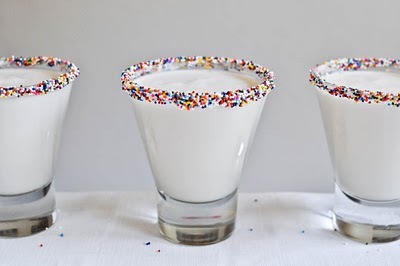 Juneberry Lane: Tutorial Tuesday: Cake Batter Martinis...YUM!!! Oh what to do when you're wrapping up an evening meal with friends and you have to make the ever-so-difficult choice of a piece of cake or an after-dinner cocktail? Why combine them, of course!! I am LOVING these delicious Cake Batter Martinis from Cosita Bella...so much fun and so pretty & frivilous too!! You truly cannot go wrong with a combination like this! 1.) 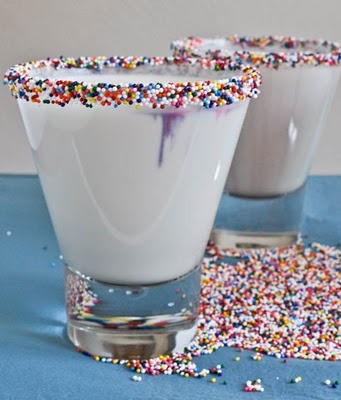 Using your finger, coat the rim of your glass with frosting – make sure not to miss any spots! 2.) 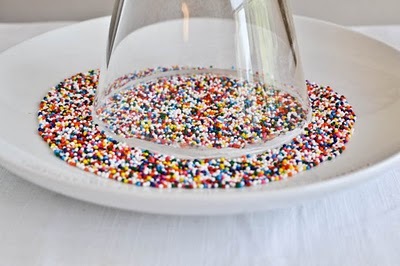 Dump sprinkles on a plate and press glass rim into sprinkles, pressing to adhere. 3.) Combine all ingredients in a cocktail shaker with ice and shake for about 30 seconds. Strain into glass and enjoy! Aren't they simply fantastic?! Dessert has never been such a good time! !